Professionally printed custom cutouts. Great service, fast production, guaranteed quality. Orders Placed by Noon Ship Next Business Day! Free Economy Shipping to U.S. Locations! Cardboard cutouts custom made from your photo are perfect for every occasion. Cardboard Cutout Standees makes it quick and easy to order your own cardboard cutout. We take your photo and create a life size cardboard cutout utilizing the latest digital printing and cutting technology. Custom cutouts from your photo are perfect for birthday parties, anniversaries, graduations, corporate promotions, and advertising. Have a friend or family member that cannot attend an upcoming event? Make a photo cutout of her and it will be like she is right there! The realism of the lifesize standee is almost unbelievable. 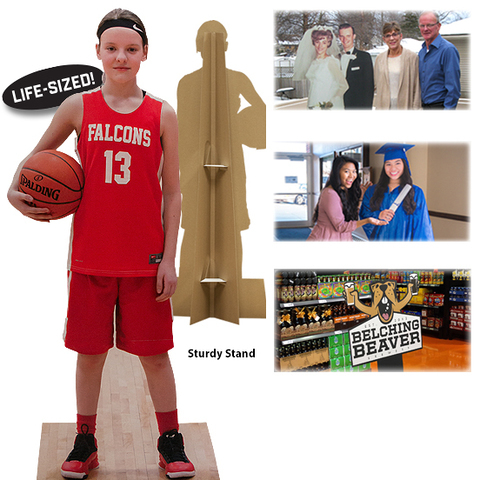 The CardboardCutoutStandees.com team of professionals will create a personalized cardboard cutout and have it shipped to you the next business day. We guarantee every custom standee we ship. If you are not happy with your personalized cardboard cutout we will send your money back.